Hull FC will be hoping to put some breathing space between themselves and Warrington Wolves when they host Catalans Dragons at the KCOM Stadium this evening. The Black and Whites bounced back from their opening Super 8 game in which Castleford Tigers won 30-16 to recover and rout Widnes Vikings 38-0 at the Select Security Stadium. Fetuli Talanoa bagged a hat-trick of tries with Jordan Abdull, Mahe Fonua, Steve Michaels and Dean Hadley all crossing for scores. The manner of the victory will have pleased head coach Lee Radford despite missing key man Marc Sneyd through injury. Their opponents Catalans Dragons have seen their season falter after at one stage challenging for the top spot. The French side have recorded just one win in their last eight fixtures coming in their first game of the Super 8s against Widnes Vikings. But all too frequently of late the club couldn’t back that up and fell short against an in-form St Helens side losing 39-16 in a game which saw Adam Swift bag four tries not for the first time this season. Hull will be looking for their fourth win of the campaign over the Dragons having beaten them home and away and knocked them out of the Challenge Cup on route to the final. After putting in a solid performance last round, Lee Radford has kept faith with Jordan Abdull and has also named Marc Sneyd in the 19-man squad. Club captain Gareth Ellis has been rested with one eye on their Challenge Cup final with Warrington Wolves at Wembley. Catalans head coach Laurent Frayssinous has lost a trio of players to injury with Todd Carney, Jodie Broughton and Justin Horo all ruled out. Coming into the squad for the trip to East Yorkshire are youngsters Romain Navarrete, Antoni Maria and Jordan Sigismeau. Published on August 18 2016 for Rugby AM. Wigan Warriors host St Helens in round three of the Super 8s in a match which has all the ingredients to be a real rugby league classic. The in-form St Helens travel to the DW Stadium full of confidence having recorded seven straight wins, the latest being the 39-16 victory over Catalans Dragons. Adam Swift stole the show with another four-try haul along with scores from Jack Owens and Joe Greenwood. They take on a Warriors side stung in their last outing by an injury-depleted Castleford Tigers losing 36-22 and Shaun Wane will be eager for his troops to respond. Wigan were well short of their normal performances and found themselves 12-0 down before Sam Powell reduced the arrears. Denny Solomana scored a hat-trick for the Tigers as they open up a comfortable lead but the Cherry and Whites hit back through Lee Mossop and John Bateman. Two minutes from time Ryan Hampshire crossed against his parent club and Oliver Holmes crashed over on the hooter to add further gloss to the score line. Both teams have won one-game apiece in the regular season with Wigan running out 24-12 winners at Langtree Park with Saints returning the favour 23-4 at the DW. 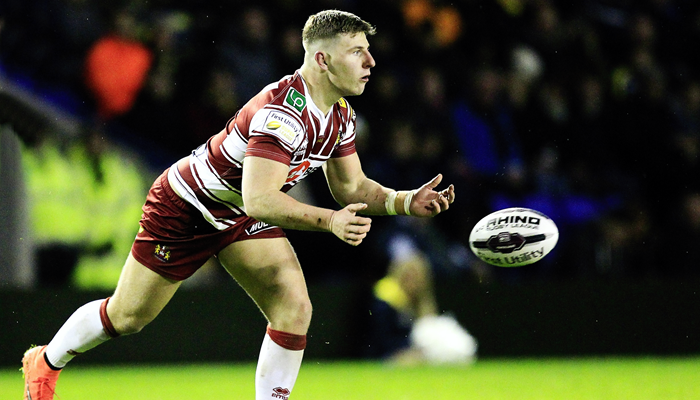 Warriors head coach Shaun Wane has been forced into changes ahead of this clash with the news that 22-year-old Dom Manfredi has been ruled out for the rest of the season with an anterior cruciate ligament injury. Sean O’Loughlin misses out with a hamstring complaint along with Lee Mossop with the trio replaced by Oliver Gildart, Joe Bretherton and Jake Shorrocks. St Helens have named Luke Walsh and Luke Thompson in their 19-man squad but the subsequent independent disciplinary committee have found the pair guilty of offences. Walsh, who had pleaded not guilty to a Grade C dangerous throw charge, has received a two-match ban whilst Thompson has also copped a similar suspension. Warrington Wolves can virtually cement their place in the Super 8s semi-finals when they take on Castleford Tigers at the Halliwell Jones Stadium on Saturday. The Wolves, who will no doubt have one eye on the Challenge Cup Final at Wembley against Hull FC, must first overcome the Tigers and they come into the game on their best run of results of the season. Since the 16-16 draw with Hull Kingston Rovers, the club has gone onto record six straight wins and sit second in the table – one point behind leaders Hull FC. Despite going behind early to Wakefield Wildcats, Wire recovered to score 24 unanswered points before Judah Mazive responded for the home side. Further tries from Daryl Clark, Matty Russell and Joe Westerman gave the away side a comfortable 38-10 win. Castleford meanwhile face an uphill battle to reach the top four spots sitting in sixth four points behind St Helens, but have done their chances the world of good winning their opening two Super 8 games. Their round one win over Hull FC was followed up with a superb 36-22 triumph over Wigan Warriors in a match which saw Denny Solomona grab a hat-trick to extend his lead at the top of the try tally. Tony Smith has opted to maintain the momentum of his squad and resisted the urge to rest some of his key players ahead of the Challenge Cup Final and made just one change to his 19-man squad. Ryan Bailey returns to the fold in place of Ben Evans as the club look to hunt down Hull FC for the top spot. Daryl Powell has made just the single change to his squad with Paddy Flynn coming into the mix in place of the injured Lee Jewitt. The 29-year-old suffered knee ligament damage meaning he will miss the rest of the season and has therefore played his last game in the Tigers shirt after agreeing to move to Australian side Townsville Blackhawks at the end of the campaign. Widnes Vikings entertain Wakefield Wildcats at the Select Security Stadium with only pride at stake with both teams unable to reach the top four. Both clubs sit in 7th and 8th place level on 20 points but the gap between the top four is too great with only five games remaining in the Super 8s. That said Widnes will want to give their fans something to cheers about having been on the end of a 38-0 drubbing away to the league leaders Hull FC. The Vikings come up against a Wakefield side beaten 38-10 on home soil by Warrington Wolves in a match they had lead early doors through Jon Molloy but fell short in the second-half. In the regular season both sides recorded away victories with the Wildcats edging a 18-16 win at Widnes whilst the Vikings did the same at the Rapid Solicitors Stadium 24-16. Widnes head coach Denis Betts has rung the changes ahead of their clash with Wakefield with Chris Dean, Rhys Hanbury, Stefan Marsh, Setaimata Sa, Gil Dudson and Tom Gilmore all returning to the 19-man squad. Losing their places are Ed Chamberlain, Ted Chapelhow, Jordan Johnstone, Macgraff Leuluai, Manase Manuokafoa, Charly Runciman. Ben Harrison is in line for his Wakefield debut having joined the club on loan from Warrington Wolves in July. The 28-year-old, who is yet to feature this season, has had a torrid run of luck with injuries that has seen him have surgery on his wrist, knee and ankle in November. The former England forward replaces youngster Jordan Crowther in the 19-man squad.